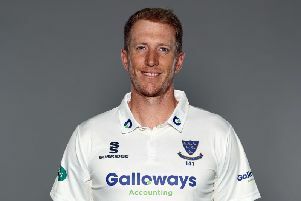 Sussex made a losing start to their Specsavers County Championship campaign with a seven-wicket loss to Leicestershire at Hove. Half-centuries from captain Paul Horton and Championship debutant Hasan Azad set things up before Australian Mark Cosgrove saw his side over the line with an unbeaten 53 as Leicestershire sealed their win 50 minutes after lunch. It was Leicestershire’s first Championship success at Hove for 24 years and the calm way in which they approached a potentially tricky target of 230, on a pitch that did not deteriorate as much as Sussex had hoped, will give Horton and coach Paul Nixon them plenty of encouragement for the summer ahead. They had resumed in a good position on 99 for 1 and Horton and Azad took few risks against some accurate bowling, particularly from Ollie Robinson, as they extended their second-wicket stand to 88 from 31 overs. Horton looked especially secure and it was a surprise when he drove hard at a ball from Robinson which nipped off the seam and thick-edged to second slip. Phil Salt parried it and Chris Jordan completed the catch at first slip. Horton batted for nearly three hours for his 61, facing 112 balls and hitting seven fours. Azad proved even more difficult to dislodge and a square drive off Mir Hamza took him to his maiden Championship 50 with his seventh boundary just before lunch. Only 77 runs were scored in 30 overs during the morning session, but Leicestershire were in no hurry. Two balls after the resumption Robinson surprised Azad with extra bounce and had the left-hander caught off the shoulder of the bat at second slip. He had faced 173 balls and hit six fours, adding 61 with Cosgrove. Leicestershire still needed 54 at that stage and Sussex had a glimmer of hope, but Cosgrove and the equally experienced Colin Ackermann quietly chipped away at the target. Cosgrove opened his shoulders to drive Chris Jordan through extra cover to reach his half-century but it was Ackermann who cut Jordan past backward point for the winning runs 50 minutes after lunch. Ackermann was unbeaten on 20 while Cosgrove’s 53 not out came off 86 balls with eight fours.